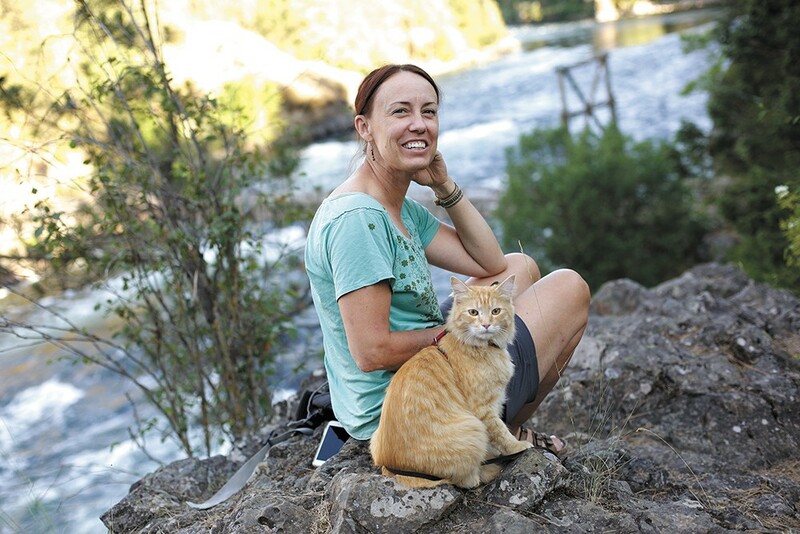 Megan Ferney takes her rescued adventure cat Leon on hikes, camping trips and even paddleboarding. Leon and Fisher go on more outdoor adventures than many humans. 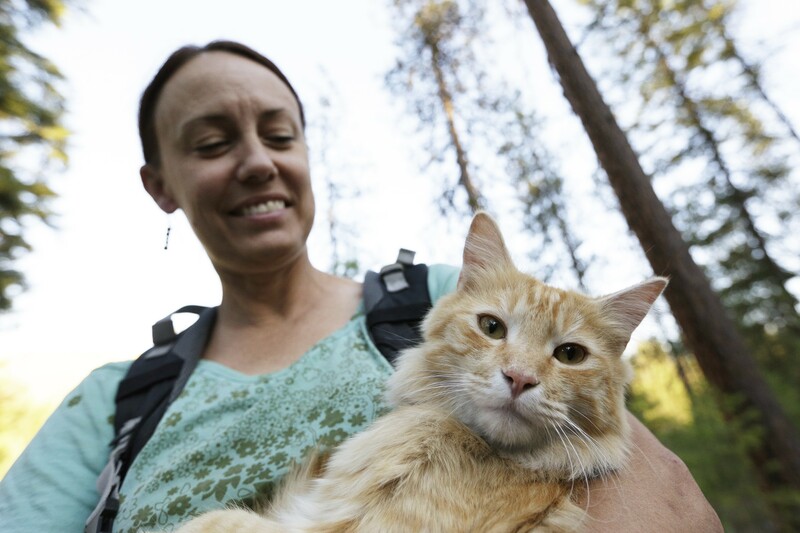 Between the two Spokane-born felines — who aren't from the same litter, but share the contemporary designation of "adventure cat" — they've traveled with their respective owners to places including the Oregon Coast, Glacier National Park, California's redwood forests and many wooded trails across the Inland Northwest. Both cats have been exploring nature's wonders for most of their young lives, since being rescued by their human "parents" last year. Leon, on Instagram as @leonadventurecat with more than 3,600 followers, was adopted as a 10-week-old kitten from Spokane County Regional Animal Protection Service (SCRAPS) last November by Megan Ferney. "I was not looking for a cat," Ferney recalls. "[His] picture came through my Facebook feed and I couldn't get him out of my mind all day long. ... Once I got him home, I knew that my little house was not going to be enough for him, and in order to keep him happy he was going to have to get outside somehow." She was concerned, though, about the dangers of traffic and other city hazards that Leon might encounter, so rather than give him free access to the outdoors, she decided to try leash-training him. Before attempting to do so, Ferney hadn't been aware of the trending, active cat lifestyle and its accompanying social media hashtag, #adventurecats. The practice of bringing (willing) cats along on outdoor adventures has gained traction in recent years thanks to plenty of incredible photos shared on Instagram and other platforms of happy felines camping, climbing mountains, paddling across lakes and otherwise enjoying nature's wonders via leash and harness. As a native of the Inland Northwest, Ferney has long enjoyed these activities, too, though she didn't envision bringing Leon along with her when she adopted the kitten, who'll be 1 year old in late summer. Fisher went on his first adventure at six weeks old. "I knew if I had an animal I couldn't leave it alone all the time while I went to hike, so I had to figure out a way to take him with me," she says. "He's gotten me out more than I would normally go — he's such a high-energy cat that he needs the exercise of going out and going on hikes." Ferney takes Leon on long day hikes and shorter walks in the woods closer to home at least a few times a week. On a recent warm Thursday, Leon, Ferney and a friend spend an afternoon in Mt. Spokane State Park, where Leon hikes a record distance of about three-and-a-half miles on his own before wanting to relax in his backpack carrier. Earlier this spring, Leon also experienced his first slow-paced paddleboard outing on Lake Coeur d'Alene. Seeing the fluffy orange cat confidently conquering local trails definitely doesn't go unnoticed by fellow hikers. "A lot of people do second takes," Ferney says, and frequently tell her they've never seen a cat on a leash before. "He has a super laid-back, chill personality and he's really brave and not afraid of things. He'll walk up to people to say 'hi.'" Upon arriving home after his Mt. Spokane adventure, the lanky orange tabby with deep gold eyes and a cotton candy pink nose is content to sleepily lounge in his enclosed, outdoor cat patio in Ferney's backyard. Leon's roomy, custom-built "catio" is connected to a window in the house by a long, wire-covered ramp so he can access it any time. "I didn't know when I got a cat how much it would change my life," Ferney says. "It's been super fun to go hiking with a cat, and the Instagram has been fun — the whole thing has been this little world I never knew about. ... There is this whole community of adventure cats." Leon's local counterpart Fisher, aka Fish, got an early start in the adventure cat way of life, too. 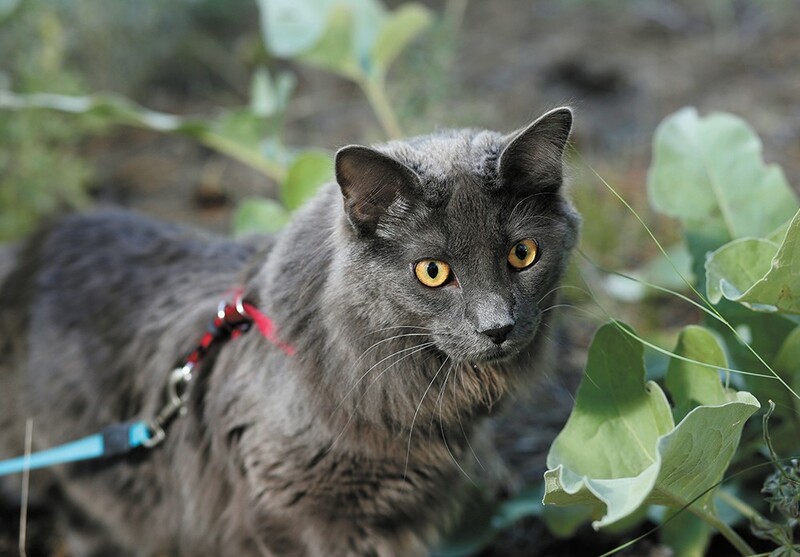 The smoke gray, golden-eyed domestic longhair went on his first adventure just one week after coming home with his owners Ryann Ensrud and Brendan Love who, last June, found the then five-and-a-half week old kitten on Craigslist. Fish is on Instagram as @cat_named_fish and currently has more than 5,800 followers. "We had a trip already planned the following week to drive down to the redwoods, so we got Fish and we were like 'I guess we'll just take him with us,' but it was a 14-hour drive," Ensrud says. Brendan Love and Ryann Ensrud with Fisher. "That whole week we had him on the leash and harness. He was tiny and didn't have a lot of endurance, but we got him used to camping and being in a backpack," adds Love. "I think that was a pretty good week for him to get used to it, as well as really bond with us." Now, Fish is confident enough to perch atop his dad's shoulders while hiking and biking, and not much phases him, including dogs, water and riding in the car for long distances. "Now anytime he hears the car keys, he runs to the door and wants to go with us," Love says. "His demeanor when he knows we're going somewhere is very cooperative," adds Ensrud. Fish has been paddleboarding and canoeing, too, and enjoys lounging in the tent while camping. When he's not adventuring, he often accompanies his humans on errands just to get out of the house, since the couple don't let him freely roam for his safety. On a recent Monday afternoon, after a casual bike ride to Manito Park, Fish is content to flatten himself out in the lawn on the end of his leash to sniff the air and munch on grass as a light breeze ruffles through his fur. A pair of dog walkers passing by suddenly notice the striking gray cat and openly marvel at the sight, a universally common reaction. "Hands down the number one question is 'Is that a cat?!' — not as if they don't know what a cat looks like but, like, what is a cat doing out here?" Love says. The original print version of this article was headlined "Adventure Awaits"